You’ve probably never heard of John Warren. But if you’re a devotee of Trove and its ever-growing collection of digitised historic newspapers, chances are you owe John and his fellow correctors more than you may realise! John is the site’s top-ranked corrector, having edited a staggering 3.44 million lines of newspaper articles in the electronically translated text on Trove. Here, he shares his tips on searching and editing Trove so you too can help improve the site for your fellow Trove tragics – one line of newspaper at a time. IH: What originally inspired you to start editing Trove articles? John: In September 2009 a distant relative discovered an article on Trove about the murder of my great grandfather. There had been rumors for many years about this, but there had been no proof until the newspapers were digitised and all of a sudden there were dozens of entries available from all over Australia. It was a very gruesome murder and thus the arrest and trial attracted much publicity. Once I got started I found all these relevant articles on my family, and eventually just graduated to generally editing articles relevant to family research. 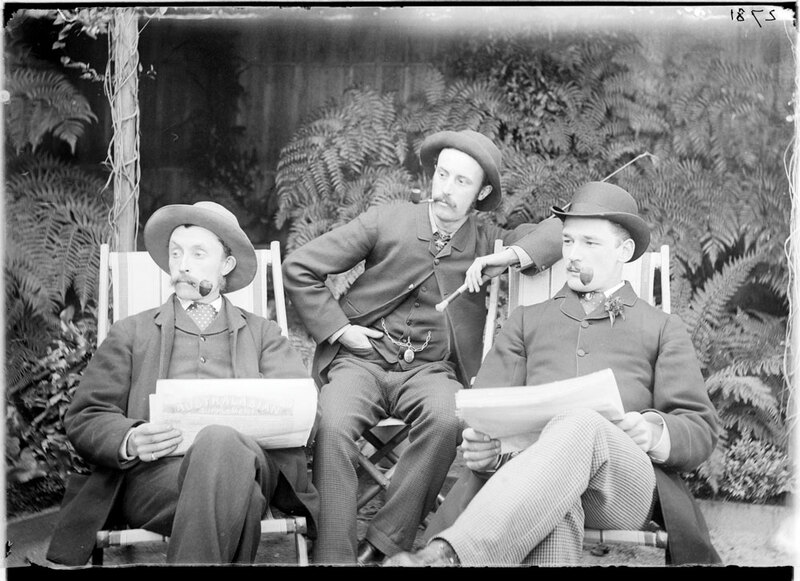 IH: How has Trove helped you research your own family history? John: Trove has helped me add hundreds of people to my tree, as well as fill in dates and places for events that were missing. My 2 x great grandfather George Martyr was a station manager for the MacArthurs at Redlands, in the Goulburn area. As such he put entries in the newspapers on the birth of each child, or marriage, and there were many obituaries or death notices. All of these added much to the somewhat flimsy information that was available through BDM records, which give you generally just the place of registration (not the actual place where the event took place), and the year or quarter in which the event was registered. Trove has also enabled family members who have noticed my editing to get in touch with me, and thus establish contact with branches of the family where prior contact had not been made. For example, a cousin from Indonesia involved in tiger conservation, and a relative in America doing extensive research on several branches of the Martyrs in particular who extended my family tree back several centuries. IH: Could you explain the process of correcting Trove articles? John: For me the process is simple. I select a newspaper to edit, and then I edit every article in that paper I can find that deals with weddings, funerals, obituaries and deaths in general. The first step involves finding the entries. For many this will be just a search for the relevant family member they may be looking for, like “Mr. C. J. Warren” or “John Warren”, maybe restricting the search to either just “Family Notices” or also to include “Articles”. The search can produce a few items, or thousands of entries. They are listed 20 to a screen, and if there are more than 2000 items in the search, only the first 100 screens (20 per screen) will be available. You edit the item by first clicking on the entry in the list, and then clicking on ‘Edit’. Then look for mistakes in the transcription. I use the mouse to highlight the incorrect item, and then overtype with the correction. Repeat the process for each line. Sometimes, you will find that a whole line (or more) is missing, and in this case you just add it to the end of the last line. You will be asked “click to add missing text” once the end of the line is detected. Image courtesy State Library NSW, ID hood_01353h. IH: Do you focus on editing any particular papers, regions or types of articles on Trove? John: Early on, after doing the 20 years or so of the SMH BDM entries, I then did some of the regional papers in areas like Launceston, Murray Bridge, Broken Hill, and most of the provincial Victorian papers, as I felt that these also deserved some attention, not only the city majors. I was born in Orange, New South Wales. So when many of the Central West papers became available, I switched to editing them, and by now I had moved away from purely BDM records to editing mainly wedding and obituary articles, and also articles covering deaths generally. So far I have completed editing of papers for places like Carcoar, Molong, Wellington, Young, Cowra, Forbes, Dubbo, and also the National Advocate in Bathurst, as well as the 11 years of the Orange Leader that so far have been scanned (1912-22). IH: For the past 15 months you’ve been linking every Trove entry to a corresponding Ancestry one. How is this done? John: As a paying member of Ancestry I have the ability to search Ancestry records for births, deaths and marriages, as well as other categories. It was in February 2014 that it occurred to me that I could add significantly to my Trove editing if I linked entries for weddings and deaths (I haven’t bothered with births) to the corresponding entries on Ancestry. This then opens up Trove to many Ancestry users who otherwise may not have know of the site. I certainly have had many appreciative messages from Ancestry users since I started this, and assisted some of them in furthering their research. I was able to find a sketch of one of the early pastors for a user who was desperate for just such an article. Thus, when I am editing Trove, I have at least two tabs open for Ancestry, one for the Australian Marriage Index, and one for the death/cemeteries Index. Depending on the Trove item, I take the name from it and then search for that name in the corresponding Ancestry index. In Ancestry, I will generally set the year of the event (say 1915), and the place (say Orange, NSW), and then enter the name. If it is “Mrs. Warren”, then all I can search on is the surname “Warren”. This will generally be sufficient, but in many instances the death will be recorded as Sydney, and I may find three Warren deaths in Sydney suburbs in 1915 for females, and unless the Trove article gives the fathers name or initials, it will be impossible to find the relevant article. Assuming that I can, then I add a comment on the Ancestry entry by quoting the link to Trove using the cite facility, like that shown above for my favorite article. I also add the name of the paper, and the date of the article. For weddings I add the “comment” to both the bride and groom’s entries on Ancestry. Since Ancestry recently added the World War I entries, I now have three open tabs, including now the one for World War I records. I have added extensive comments from the Orange Leader and the National Advocate from Bathurst to these. I try to add entries starting from the reports of enlistment and farewell, to promotions, to their letters home, to the official notification of death or returned wounded and so on. In some cases I have added up to 30 comments to an individual who was prolific in writing home. This has been particularly pleasing, and I am in the process of re-working all the Leader articles for 1915-19 to pick up on these World War I entries. I am still in fact doing them now, being almost through to the end of 1916. If other sites allow you to add comments to their records then something similar could be possible on other websites. IH: What’s your favourite story you’ve come across on Trove? John: My favourite article is an obituary for Monty the police tracker in the Goulburn Evening Penny Post in 1933. This is the story of an Aboriginal child left by his tribe and taken by some white men eventually entered the New South Wales police force. He was a brilliant tracker and horseman. Click here to read. IH: Was it a goal of yours to become the number one Trove corrector? John: I didn’t deliberately set out to become No. 1. When I started I think Julie Hempenstall was No. 1 and she had corrected around 250,000 lines. It seemed far off then, but in fact I became No. 1 on 16 September 2012, so just under three years after I started, when my total was 1.36 million. My total now is over 3.44 million. IH: How many hours would you spend on Trove in the average week? John: Probably 40 or more at least – I “work” hard at something I enjoy doing. With all the talk of older people volunteering their time, I though that this is what I would like to do as my volunteering effort. I have worked with computers for 50 years now, first getting involved in 1965 at the Australian Bureau of Statistics in Canberra. I get a lot of pleasure out of what I do. IH: What do you find most rewarding about your work on Trove? John: The fact that I know the work I do is appreciated by others insofar as it assists them with their family research. I also learn a lot about the people who helped build our country, and many of the articles, particularly the obituaries, are very moving. For the World War I entries, the letters home are so very interesting, and some you can tell were used in producing the recent spate of shows on TV. They were, where possible (due to censorship), very down to earth, and provided much insight into the day-to-day life of men in the trenches, and described in graphic detail the death of comrades. Image courtesy State Library of Victoria, ID Image H86.76/42_PP.